This October, Germany will host two great events for foam lovers – Oktoberfest in Munich and PADDLEexpo in Nuremberg. 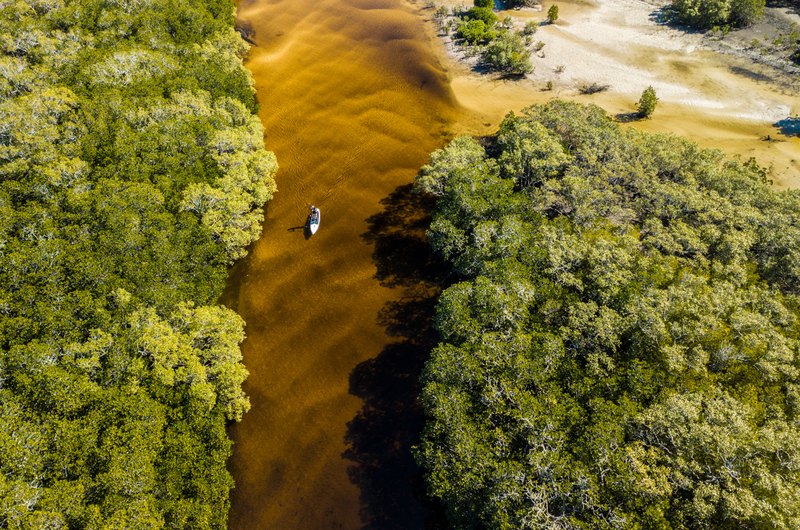 After giving it great thought, we decided to drop into these great gatherings of paddlers of all kinds and give you a sneak peek at everything new in SUP for spring 2019. A buyer’s guide as refreshing as an ice-cold beer with David Bianic. Cheers! There are signs that don’t lie. After ten years of (discrete) partnership between PADDLEexpo and ISPO, the Munich tradeshow is starting a new chapter that will give new visibility to paddle sports through the creation of a Paddlesport Village in the heart of the premier OutDoor by ISPO from June 30 – July 3, 2019. 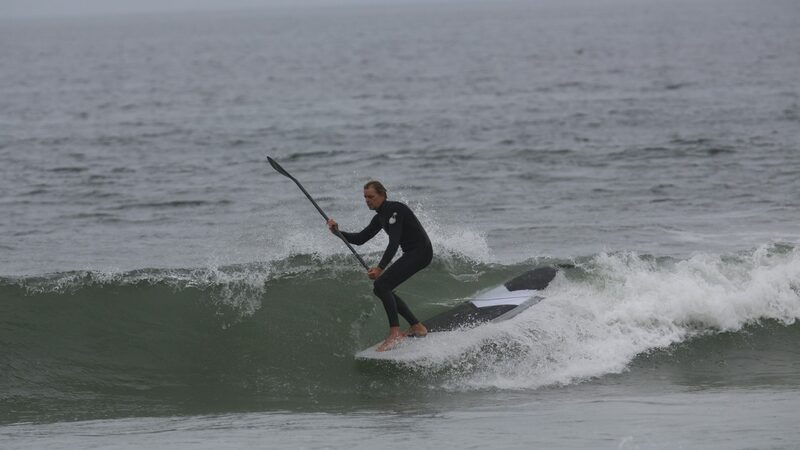 This inclusion is a further demonstration of the gradual integration of SUP into the boardsport family, as well as the great crossover between the worlds of outdoor and action sports. And it’s not just a feeling. 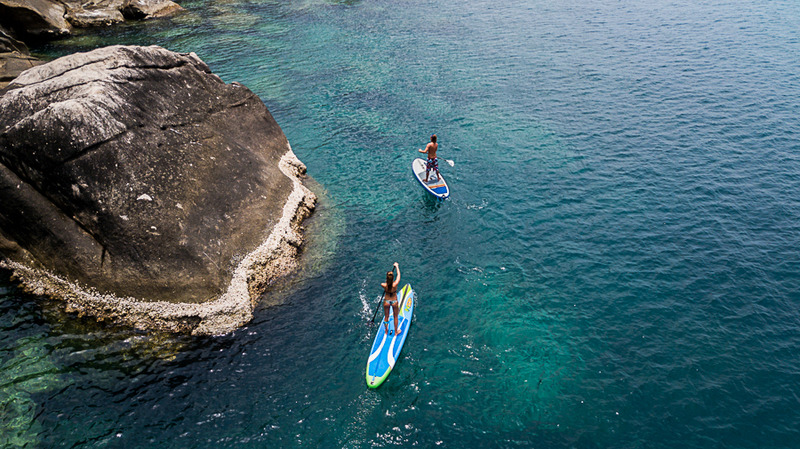 The figures concur and indicate a market consolidation, with an average annual growth rate of the global SUP market estimated at 11.9% from 2018 to 2028 (according to the Stand Up Paddleboard Industry 2018 Global Market Trends study). 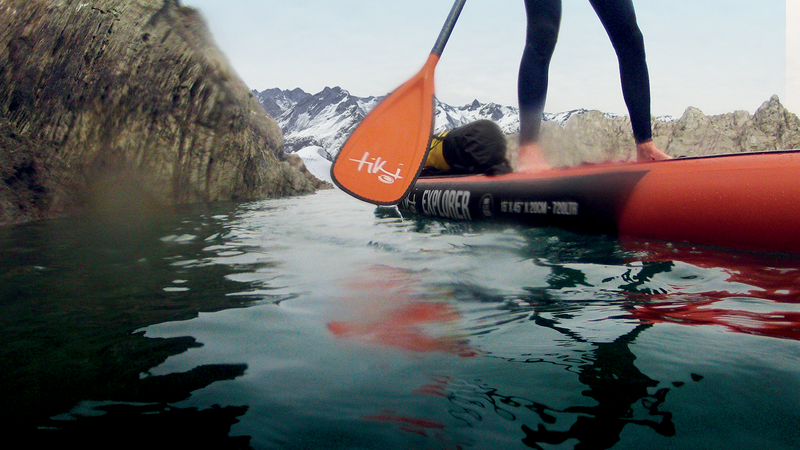 Nonetheless, hidden behind these stable growth figures there’s a ferocious fight between the authentic actors of the SUP sector and the unscrupulous big-money manufacturers seduced by the easy accessibility of the inflatable SUP market. For Airboard CEO, Joe Steiner the results are a double-edged sword with on one side “a massive increase in terms of production and sales volume,” and on the other an ever increasing number of pseudo brands and direct imports from Asia. Some manufacturers have decided to fight these non-brands on their own footing, like Germany’s Indiana, who’ve released a new brand, Apatcha, designed to “cover the lower price market,” explained Co-Founder, Maurus Strobel who is offering two boards at 599€ and 699€ including kayak seat and accessories. Distribution channels are multiplying and because SUP consumers don’t share habits as other boardsports enthusiasts, it leaves the door open for non-boardsport brands to enter the market. 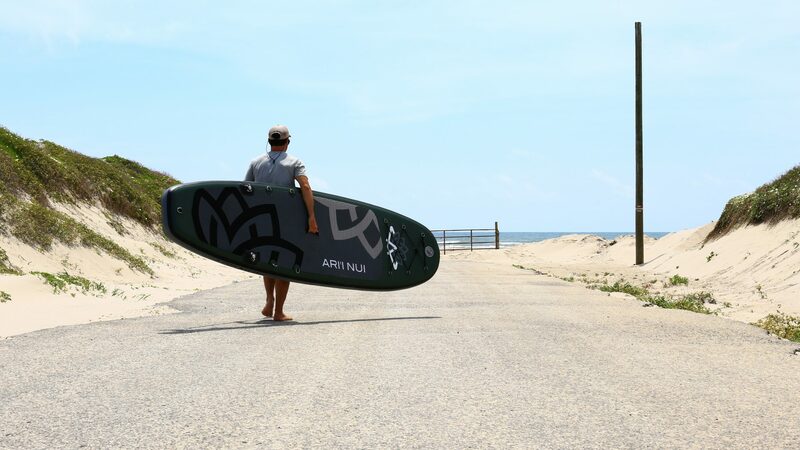 “It’s possible to find SUP across many channels: online, in surf shops and outdoor shops, but also in supermarkets, pool stores and so on,” Aquadesign manager Terry Barbier pointed out. Brands are adjusting their sales strategies, trying to find the right balance between retailers and direct sales, like Mistral, who put more emphasis on online sales: “a key area in which we are having to expand our focus in order to meet the growing demands of end-users,” specified Steve West. Another growing trend is the arrival of surf apparel companies who are putting their trust in proven manufacturers from the sector. After the BIC/Oxbow partnership, it’s Body Glove’s turn along with O’Neill to offer boards (mostly inflatables) produced by One Kin (Lokahi). Amongst the 300 or so exhibitors who will open their stands to professionals over the course of the first weekend of October, many depend on the show to fill their pre-order books with an eye on next summer. To maintain an element of surprise, some keep their lips tightly shut, like Joe from Airboard: “We need to keep the news under cover – to not be copied, before exposing the latest innovations.” Luckily for us, other brands are more talkative: “For PADDLEexpo, we will bring our entire fleet of boards,” NSP Marketing Director, Caren Forbes assured us – most notably the Quest, a new adventure-style iSUP (whose USP is a triple cylinder system), along with their 2019 race board, the Carolina Race. At Red Paddle Co., John Hibbard is betting on a less-is-more philosophy when presenting their Compact model, and you heard it here first: “It packs down to half the size of a standard inflatable board but still retains the Red DNA of a no-compromise experience.” To be able to do this, the English firm developed a new material, the PSL Pact, gifted with a high-density core with a mesh matrix, and an exterior coating that makes the board more packable once it’s deflated, while the stiffness is guaranteed by a quadruple stringer. It’s without a doubt one of the leading models to check out at the show. Equally exciting, the new Antitorx system that will be presented by RRD at PADDLEexpo – an inflatable anti-torsion construction that will be added to their Perfo technology, aimed at race and downwind fanatics: “Antitorx is a special system built with two stringers of TPB (Thermo Plastic Belt) 3cm wide crossed all together to prevent any possible twist of the board, also in choppy conditions,” explained International Surf and SUP Marketing Director, Jacopo Giusti. Over at Ari’Nui, they will also be presenting a new inflatable single layer construction, the H-light, with a PVC stringer on the top and bottom, as well as a new model for SUP yoga, accompanied by “a new platform concept that can evolve to create different groups and capacities,” pointed out Benoît Brecq. 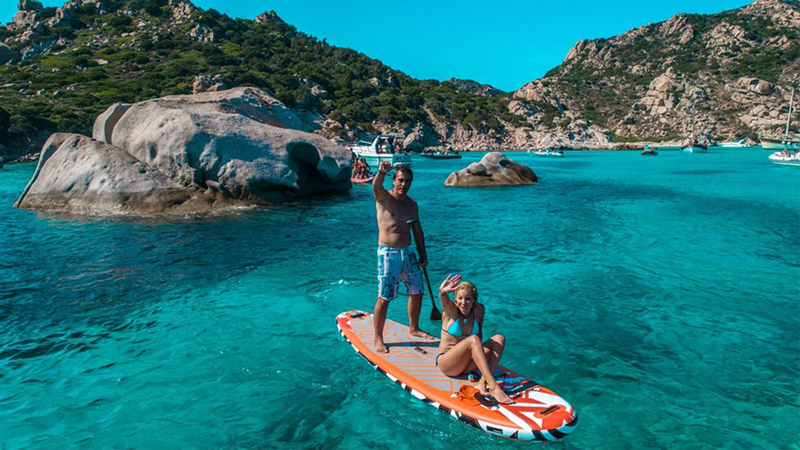 Starboard is also continuing the progression of its high-end dropstitch fusion model called Deluxe: “Not only the deck and bottom are made with fusion technology, the rails are also welded on all inflatables,” revealed Starboard Germany’s Marketing Manager, Florian Brunner. They’re not the only ones taking a closer look at rails on inflatables (a technological weak point). 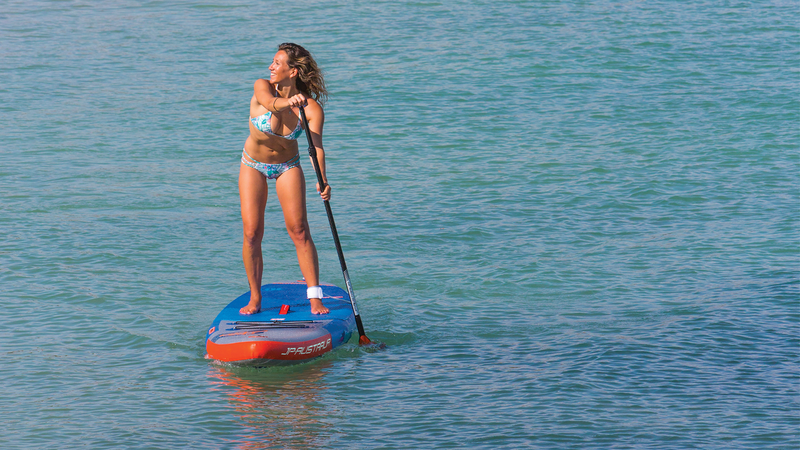 Of note is the DoubleStack technology from American firm Hala Gear, which is very present in the SUP river category: “This patented, narrower rail system can be found on the 2019 Hala Peno and 2019 Hala Playita,” revealed Communication Manager, Olivia Ohegyi before explaining that “a stacked, lower-volume dropstitch tube creates an edged rail, which enhances carving responsiveness.” Fine-tuned rails are as important in the race field and Philip from JP Australia is stoked that “a great number of our iSUPs now come with a real trailing edge, which gives them way better glide abilities resulting in faster and longer distance covered by each paddle stroke”. An interesting example of these performance-oriented iSUPs will be their JP CruisAir, now available in LEC construction (Light Economy), a 2-layer and 6’’ thick touring board, “for a very interesting price”. 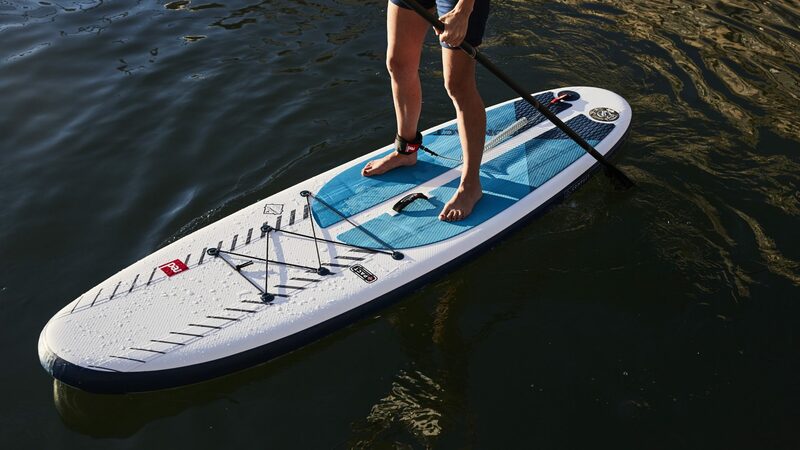 As we’ve talked about in SOURCE in the past, the Tripstix 10’ Allround, built using the VaccuAir technology will also be eagerly awaited in the aisles of PADDLEexpo. 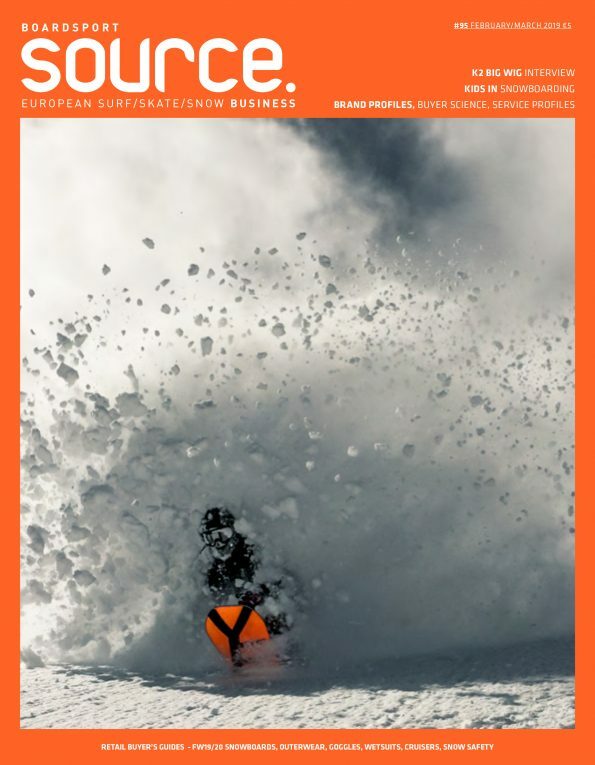 Just a reminder, it’s a multi-chambered iSUP, whose compartments are filled with granules, which once vacuum packed, gives the board its stiffness, “like a pack of coffee,” promised Stefan Klare. Multi chamber inflatables are definitely popular, like the double chambered Touring model by Aquamarina, as well as the Mistral iSUPs with four air sections, while the brand is also abandoning the classic dropstitch for a woven construction “offering lighter weight per square metre and improved rigidity,” affirmed Steve West. Jobe has also worked to evolve the heart of its iSUPs with “a cross stitching instead of normal drop stitching,” revealed William Doornekamp, the aim being to achieve the same result: less weight, more rigidity. At the same time, their traditional decorative stripe down the centre of the board has now transformed into a functional stringer – adding a layer of material to stiffen the board. Another brand searching to reduce excess kilos is I Love SUP (the brand by JLID Distribution, which also imports Jimmy Lewis and Infinity). They’re promising a 25% lighter board next year thanks to “a secret process directly from the best manufacturer on the market, 3ms,” announced Leonardo Lazzeri. They say the devil is in the details and Body Glove know it well, offering a particularly clever central handle on its iSUPs, made from a comfortable neoprene, it features a Velcro strap for attaching a paddle or water bottle, as well as two small, very useful D-rings. Generally, composite hardboards evolve little in terms of construction, but it’s now easier to read between the lines in the catalogues and identify which technology corresponds to the board’s intended use. 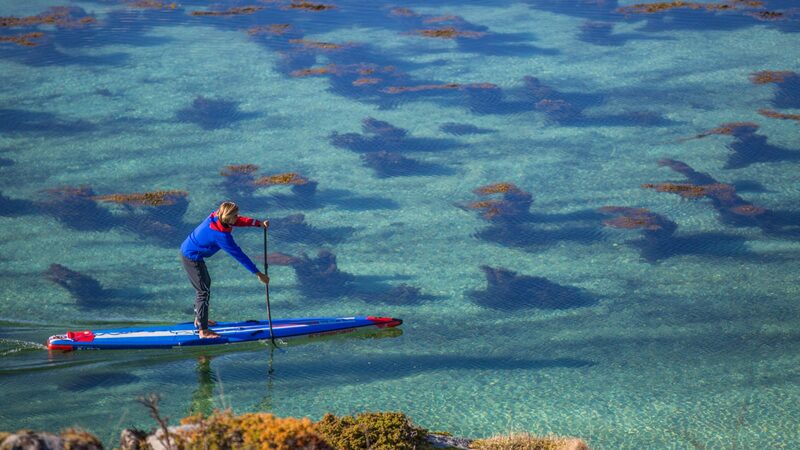 Norden offer a Surf Glass technology on their high-performance surf SUP models, sandwiched Double Wood on their intermediate and all-round models, while their race models continue to swear by carbon only. It’s pretty much the same at Fanatic, whose wave boards are either made from their Custom Surf or Vectornet technology, while their more polyvalent boards are made with a bamboo sandwich construction, and finally, their race/touring models with a carbon sandwich construction. As Lukas from Siren SUPsurfing summed it up, “we don’t see the importance of inventing something new every single year.” Lessons seem to have been learned: gone are the catalogues multiplying references and technologies (sometimes on the same model), the SUP industry wants to avoid confusing consumers and equally the phenomenon of overstocking followed by non-stop promos. Added value, that is the message, as confirmed by Phil Bridges from Tiki: “We are careful not to generate short shelf lives by releasing new tech and new colours, designs, etc. year after year, as that practice is not helpful to retailers.” And indeed, the multi-product brand (surf, SUP, bodyboard, neoprene, accessories and textile) is offering the same range next year as this, aside from one new model. The environmental aspect has not been neglected either, with the new Fanatic Fly Eco made from flax, cork and wood, in place of fibreglass and PVC sandwich. Starboard also wants to make their composite models cleaner, producing them with bio-resin and using other sustainable technologies such as flax and balsa: “The 2019 Blue Carbon boards are the first ever Gold level ECOBOARD SUPs,” [from the Sustainable Surf organisation] Florian Brunner said proudly. The same efforts have been made by Lokahi, which highlights the manufacturing of its eleven hard models made in the heart of their brand spanking new French factory. The brand uses recycled and eco-friendly materials as much as possible: “All sourced in Europe from the EVA, to the resins developed for us, the fibres and all sandwich components,” said Product and Brand Manager, Sylvain Aurenche, before reminding us that the production facility is open to any brands interested in their eco-conscious processes. 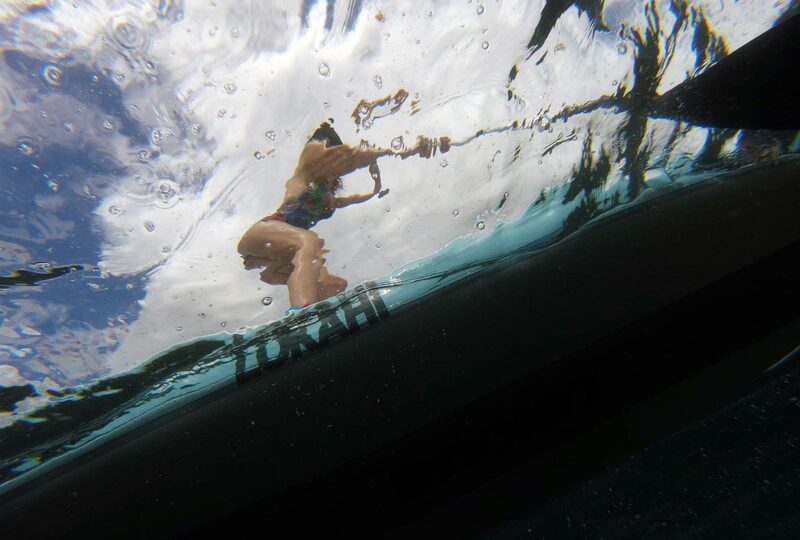 Of course, foiling will be on the menu as well, with Fanatic unveiling its new Sky SUP & Surf models, “two 100% dedicated foil boards for lots of fun in the waves designed by Sky Solbach,” announced Marketing Manager, Karin Gertenbach. That’s not all – Fanatic will present its new Aero Surf Foil 1500, “the fastest and most versatile foil setup to date designed by Kean Winner.” At Infinity, a foil baptized Tombstone will hit the market next year, just like at the giant NSP that has, “targeted the entry level SUP foiler with our first production board, as we feel the sport is in its infancy stages and we want those just getting into the sport, to have a great experience and feel comfortable with the board under their feet,” explained Caren Forbes. Throw JP Australia in the mix – with “a special and dedicated foil & foilboard which makes it easy and accessible to experience this new dimension” – and all the big players have now upgraded their SUPing ranges to the above water experience. The foil ranges are filling out with generally speaking a high-end all-carbon offering on one hand, and more accessible aluminium alternatives on the other, like at Indiana: “There are two different carbon front wings with 120cm and 85cm spans, and three aluminium mast options with 50, 75 and 90 cm,” specified Maurus Stroble who also offers three SUP foil boards. But most brands are still hesitant about entering this market segment, and with good reason: “Foiling right now is a creative distraction away from the grass roots of pretty much every board sport […] and it is also proving to act as a destructive force. SUP is still attempting to define itself and along comes foiling to act as yet another confusing influencer and optional extra,” analysed Steve from Mistral. And when he speaks of a destructive force, we can take his words seriously, backed-up by Andrew Mencinsky from Boardworks/Rogue who evoked, “a ton of complaints about breakage and poor performance,” and wants to position himself in the market in 2019. For Andrew Mencinsky from Rogue (celebrating its 10th anniversary in 2019), the two are not incompatible, on the contrary: “We believe everything we learn at the highest performance levels trickles down to the average consumer.” Obviously, for a brand like NSP, whose riders such as Travis Grant and Titouan Puyo grace international podiums, racing’s impact can’t be neglected. Caren Forbes answered: “Racing makes up about 10% of our sales, however, with each win at each event, our race program is driving awareness to all our product lines.” We got the same feeling from Anthony at SIC, a brand where “35% to 40% of our range is dedicated to elite and recreational racing.” Even if racing only accounts for 6% of sales in the US, he feels that the investment in the discipline wears off significantly on the brand’s image – a feeling confirmed by Karin at Fanatic. Above all, the question is to really know the values your brand embodies, highlighted by Sylvain from Lokahi, a brand that stopped producing race boards to come back to the original brand DNA: “Accessibility to all, touring and wave riding.” For the 100% inflatable brands “the [race] market is not representative,” felt Terry from Aquadesign, “however, they are essential products if you want to aim for high-level products and brand value,” mentioning the Race Bi-Drop (dual chamber) model that won the prize for the most innovative board last year at PADDLEexpo. It’s a rather positive observation for core retailers that can/must continue aiming at a performance-oriented approach (surf/race/touring/foil) to complement the all-around low-cost offers. Because who else, if not them, possesses the knowledge and has the tools to sell the “sport” and not just a “recreational activity”?